On the water with ocean access!!! 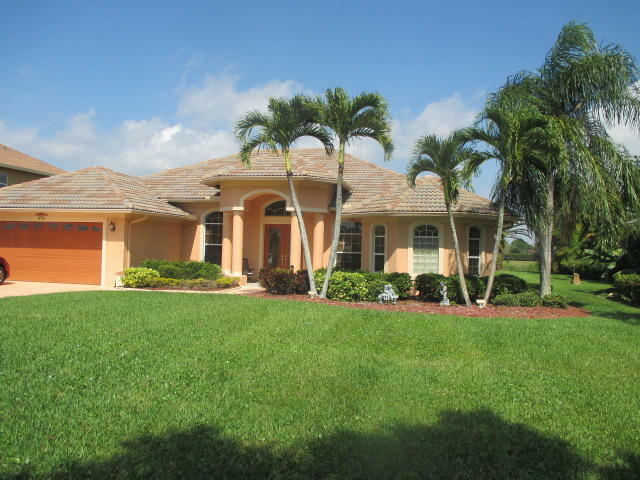 Spectacular 2900 sq ft (3900sq ft total) 5-bedroom 3 full bath waterfront estate home in port st. Lucie with 90 ft frontage on the c24 canal and only 45-minute boat ride to the stuart inlet, via the north fork of the saint lucie river large two-level dock with 20 ft x 30 ft main level with large shade gazebo and fish cleaning station, and a 5 ft x 20 ft lower level dock for easy boat docking/loading. A 10,000-pound boat lift currently supporting a four winns 254 fs boat. (boat is negotiable). Property is just over one half acre is fully landscaped and complete with underground sprinkler system. For more information or make an appointment to see property ID RX-10509878.